(TibetanReview.net, Oct15, 2014) – The head of the exile Tibetan administration at Dharamshala, India, Sikyong Lobsang Sangay has on Oct 13 called on nations to opt for morality if forced to choose against money, attributing this principled stand to the Czech Republic’s late first President Mr Václav Havel. The Sikyong make his comment while speaking at the annual Forum 2000 conference held in the Czech capital Prague. 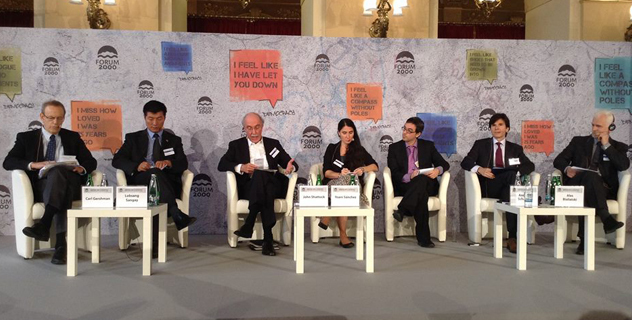 He participated in a panel discussion on “The Significance of Václav Havel’s Value-Based Foreign Policy” on the second day of the Forum. Others who took part in the panel discussion included US Ambassador Andrew Schapiro, US’s National Endowment for Democracy President Carl Gershman, Belarus’s Viasna Human Rights Centre President Ales Bialiatski, and Cuban blogger and activist Yoani Sanchez. The Sikyong has expressed disappointment over the growing tendency on the part of government leaders to meet with the Dalai Lama due to fear of offending China. He has described Mr Václav as “a moral warrior” and called for moral support from around the world for the Tibetan struggle for democracy and freedom. In this context he has also expressed dismay over the current Czech government’s growing economic ties with China and its consequent adverse position on the Tibetan struggle. Forum 2000 is designed to pursue Václav Havel’s legacy of values-based democracy and respect for human rights. This year’s theme is ‘Democracy and Its Discontents: A Quarter-Century After the Iron Curtain and Tiananmen’. Around 200 global leaders in the fields of politics, academy, civil society, media, business and religion attended the conference. They are meeting to reflect on the last 20–30 years of democratic transitions, assess the current state of democracy, and explore aspirations for the future of democracy. Tibet’s exiled spiritual leader, the Dalai Lama, has in the past taken part in the conference, joined by the Sikyong since the latter’s election as the exile Tibetan political leader in 2011.